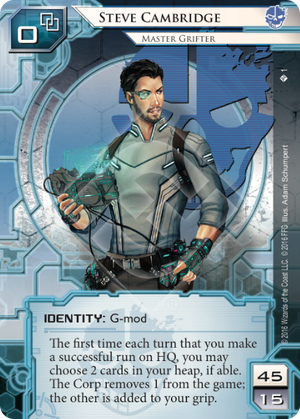 Can the Runner choose to look at the top card of R&D with Find the Truth before using Steve Cambridge? Yes. Both cards meet their trigger conditions at the same time, so the Runner chooses the order in which they trigger. If the Runner returns Utopia Shard to their grip with Steve Cambridge, can they then install Utopia Shard? No. In order for Utopia Shard to install itself with its ability, it must already be in the Runner’s grip at the time it would meet its trigger condition. If the Runner, playing as Steve Cambridge, plays an Account Siphon, can they choose that copy of Account Siphon as one of the cards for Steve’s ability? No. An event that initiates a run is not considered fully resolved until that run is complete, and thus is not trashed until afterward.